The successful Deepings Swimming Club squad at the Lincolnshire County Championships in Louth. Deepings Swimming Club enjoyed one of their most successful ever Lincolnshire County Championships after the team won 36 medals, including 13 golds, over the second weekend of competition in Louth. Medals were won on all four strokes and across the age groups, from 10/11 years to 16 years/over, and took the club’s total over the two county weekends to 63, of which 21 were gold. Ten-year-old Alex Sadler again proved untouchable in his age group. He won seven events (50m and 100m freestyle, 100m and 200m backstroke, 50m and 200m butterfly and 200m individual medley), taking his medal tally at the 2018 championships to 12 golds. Sprint specialist Alex Wray returned to the club from Loughborough University and broke his own county short-course record in the 100m freestyle to take the open championship title. He also added the 50m freestyle county title, winning in a time of 22.83 - more than two seconds ahead of his nearest rival, a huge margin in this event. Isabel Spinley continued to dominate the butterfly, adding 50m and 200m county titles to the 100m gold she won at the first weekend in Grantham. Her margin of victory in the 200m butterfly was more than three seconds. 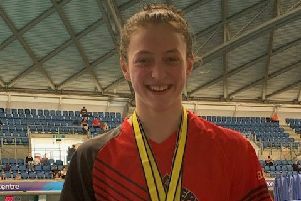 Bethany Eagle-Brown completed the gold medal winning performances at the second weekend of county competition, with age-group wins in the 100m freestyle and 50m butterfly. Eight swimmers shared 11 age-group silver medals: Tom Neal in the 50m freestyle, 50m butterfly and 200m backstroke; Jake Jungmann in the 50m breaststroke; Louis Metselaar in the 50m and 100m breaststroke; Lara Treharne in the 50m butterfly; Tom Adams in the 200m butterfly; Isabel Spinley in the 200IM; Bethany Eagle-Brown in the 50m freestyle; and Harry Cardell in the 200m butterfly. Completing the medal tally were age-group bronze medallists Jake Jungmann in the 100m and 200m backstroke and 100m freestyle; Tom Neal in the 100m backstroke; Oliver Harrison in the 50m and 100m breaststroke; Bailie Harrison in the 50m butterfly; Sophie Baskeyfield in the 200m butterfly; Bethany Eagle-Brown in the 200IM; Isabel Spinley in the 50m freestyle and 200m backstroke; and Holly Leggott in the 50m freestyle. The squad also achieved 28 Midlands regional qualifying times, including Molly Briers (200m butterfly) and Tiffany Wong (50m butterfly) for the first time, and 67 personal bests. Eight swimmers will be racing at the final weekend of county competition on February 17 in the 800m and 1500m freestyle, while Isabel Spinley and Bailie Harrison will go on to compete at the British Championships in Edinburgh at the beginning of March. Deepings Swimming Club head coach Lynn Chapman said: “There were so many things to be proud of at this year’s county championships, which is already one of our best ever. Isabel and Alex again showed just how strong the talent is at the club but we also have plenty of younger swimmers coming through to challenge. They showed excellent progression in their skills and stamina.